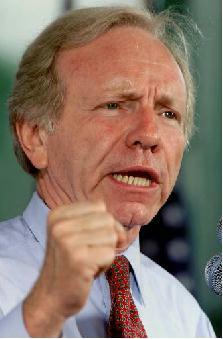 Joseph Lieberman could be the most important name in American politics since Thomas Jefferson. His inspired bailout on the Democratic Party for an independent run for senator from Connecticut, if successful, might just begin to erode the two-party monopoly that has heretofore damaged our delicate hold on democracy for over 100 years. Think I’m being too dramatic? Really? Check this out, Jack. Unless you’ve been hermetically sealed for the past decade this whole two-party thing has reached a polarized critical mass. The usual black and white nonsense pitched by liberal to conservative agendas has never been more embedded, leaving a proving ground for militants and goofballs the likes of which no free society could survive. In many ways it has become absurd, and more so, dangerous, as it has rendered candidates for either the Democratic or Republican parties hostage to many social, cultural and/or fiduciary issues that command the party line. All this slaking the extreme right or left wings of said parties has made plastic tools of politicians and reduced the vagaries of debate and voter confidence to a dense morass of “us vs. them”. And although this works in the odd theocracy or fraternity kegger, it is hardly a sober guideline for governance. Joseph Lieberman, fresh from a humiliating party horsewhipping for the past months, is going to ignore his defeat as a Democrat and run for senate as an independent. It is this observer’s opinion that he will win, and when he does there will be a minor tremor in Washington politics, that may, if there is an ounce of justice and progress and true intelligence in the design of this republic, escalate into a full-scale quake that rocks the foundation of this partisan stalemate on free thought within our currently cracked system. Lieberman, independent, free to offer an alternative to “one way or the highway” can actually live or die on the grounds of his own beliefs, however brilliant or abhorrent they may be. The voter choice will be for a single voice and not the collective. The fog cleared, the din abated. Lieberman, independent, free to offer an alternative to “one way or the highway” can actually live or die on the grounds of his own beliefs, however brilliant or abhorrent they may be. Oh, it’s a long shot, but dreams die hard here at The Desk. Twenty-four years of independent voting, ranting, arguing, and literary bitching could render a serviceable pay-off after all. Lieberman gives the Democrats the finger. He becomes an independent candidate, runs on his own platform that is judged merely by its “independent” ideas and goals, and not that of some odious conglomerate pushed by party heads and special interest fops, and wins going away. Other party pariah’s who dare think outside the agenda of both parties copycat the revolutionary concept of “thinking for one’s self outside the shackles of black and white resolve”. Candidates once again represent the people through their own devices, and not that of blind allegiance to a one-note dirge. Parties suffer. Freedom wins. Everyone wins, because everyone will want a piece of the pie. That’s what winning does, it breeds imitation. Politics is not unlike professional football. Whatever scheme makes good every other team and coaching staff is running to repeat it. Every so often there is a maverick, and if he hits the jackpot with victories, soon the pack will follow. Doesn’t always work out in every individual case, but the sport is revived anew. That is how we see this Lieberman Experiment, but only if it succeeds. So it absolutely must succeed. Lieberman was jobbed from the beginning. The Democrats have talking points that begin with bashing the Iraq War, which opposes nicely the stupidity of the Republicans race to ignore it. However, Lieberman has stood by his conviction that the war, however mishandled and junked, was necessary. Unlike fellow Democrats who voted for it (the comedy team of John’s Edwards and Kerry) Lieberman is staying the course. It may be shortsighted and political suicidal for an opposing party member to back a fantastically unpopular president and his mounting folly, but to his credit Lieberman is consistent. This got him the boot. Lieberman’s defeat in last Tuesday’s Democratic primary to his entertainingly loquacious challenger Ned Lamont, the perfect party dupe, was a measly six percentage points, or roughly 100,000 votes. These are votes easily made up by independents and moderate republicans disgusted with right wing screw-ups, but fearful of pie-in-the-sky revisionists. The question is will these people see this as an historical imperative or a sore loser’s attempt at vengeance. The answer, I believe, will echo loudly against the two-party lethargy, which trumps this “throw the bums out” ripple against incumbents everywhere. Also, Lieberman can win because he’s been entrenched in his position since 1988, and as is New England’s political wont, there’s always room for the “same old”. He has a rich history of incumbent crushes on his side. These people love to keep the boys coming back for more, regardless of bad behavior, scandal, or just about anything – see Ted Kennedy for the best example. Lieberman’s loss made him only the fourth incumbent senator to lose a primary since 1980. This bodes well for his name being on a ballot come November. In conclusion, it will be nearly impossible for Lieberman to lose, unless there is some underhanded political chicanery, which there most certainly will be, but that cannot derail him. His corny “Team Connecticut” campaign must focus on a rally for new horizons and blazing trails and all that rah-rah poop, and not any goofy pictures of him tonguing the president. Look, I don’t like Joseph Lieberman. I despise his sanctimonious moralizing most of all. Not the point. And maybe he truly is a sore loser trying to change rules to benefit his own gain. Hell, that’s fine. Whatever it takes. There was a whole lot of changing the rules for personal gain going on in Philadelphia in 1776. Fairly sure I dislike half of those jokers. The results were pretty good, though.